Research shows that Korsakoff’s syndrome can occur in many dependent drinkers, yet the condition is rarely acknowledged and understood. Glenn Barnett explains the syndrome, which causes severe memory disorder, and shares a new model to support those affected to help them back to community living. 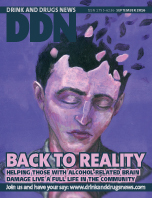 Throughout this month’s new articles we have some fascinating thoughts on our responses to addiction. Is it a learning disorder rather than a disease, as Maia Szalawitz suggests? Will we listen to new evidence to reshape drug policy, asks David Nutt. And what should be the purpose of harm reduction – as primary goal or to eliminate drug use? Mike Ashton presents both sides of the argument. Read on for ideas and inspiration, including a look at how some innovative treatment services are responding to the complex problem of painkiller addiction.